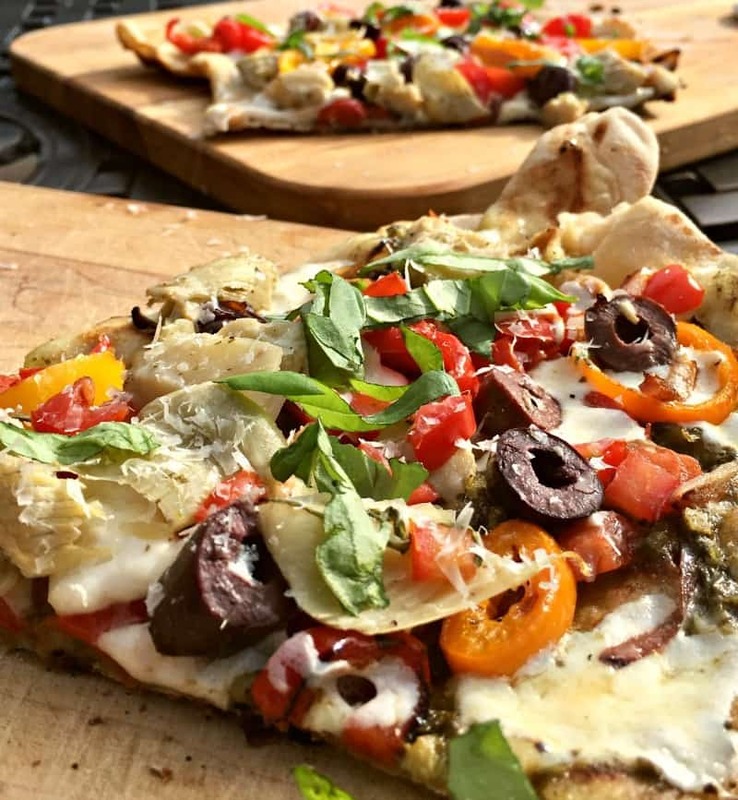 Learn How to Grill Pizza at home ~ thin, lightly crispy-charred tastes like wood-fired from your favorite restaurant, topped with all your favorites. We’re a pizza-loving household and even though we don’t always agree on toppings, we always enjoy it homemade, hot out of the oven. 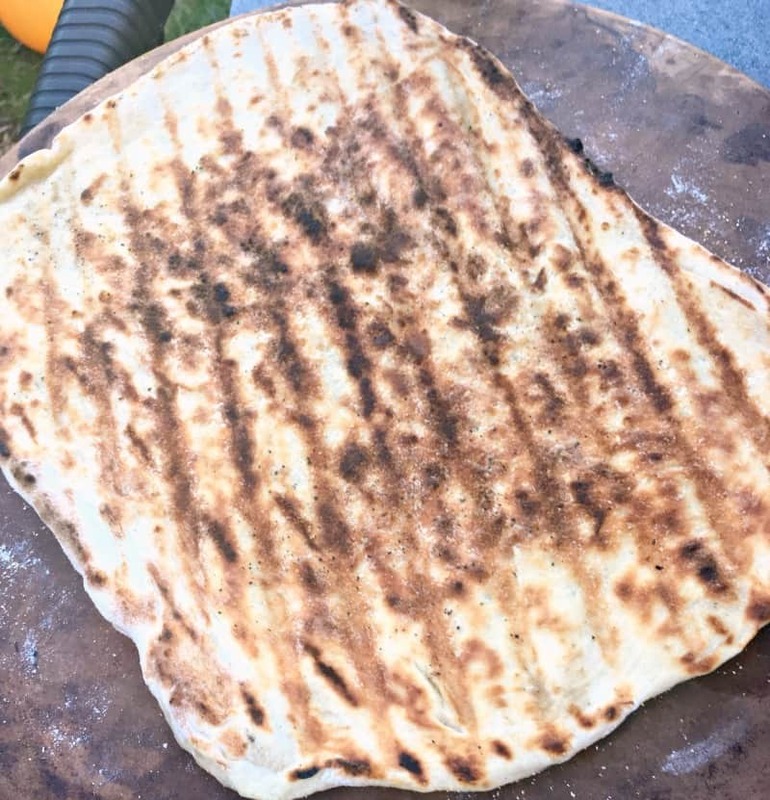 I thought by now we had grilled everything from hot dogs to jalapenos; steak to potatoes, until I realized we had never grilled pizza ~ probably because I didn’t know how and it seemed intimidating. So when we finally had a sunny, warm day in the middle of the wettest spring I can remember, I decided to roll up my sleeves, fire up the grill and learn how to How to Grill Pizza. I’m not a trained chef ~I’m a home cook, just like you (unless you’re a trained chef, in which case you could probably teach me a thing or two ~ please). As a food blogger I cook a lot ~ and make mistakes in my kitchen ~ so that you’ll have cooking success in yours. I learned How to Grill Pizza and with the tips below, you can too. After reading a few recipes online I decided to jump right in. The result was that I was thrilled with the lightly crispy-charred crust but the cheese didn’t melt the way I expected it to. The good news is that I learned a few things to remedy that and I’m sharing them here. Remove the pizza from the grill before adding any toppings. After flipping the dough, I started adding pesto and other toppings. Not only did I sacrifice some skin on my hand working over a hot grill, but because the lid was open so long the grill cooled down and the cheese didn’t have a chance to melt before the bottom of the crust was done. When you turn the dough over, transfer it to the baking sheet or stone, add the toppings and return it to the grill. The lid of the grill should be closed while you’re doing this. If you’re including vegetables (onions, peppers, etc), grill or sauté them before grilling the dough. You’ll also want to slice or tear the cheese and basically have everything ready to add to the pizza before grilling the crust including extra olive oil and brush, spatula and tongs. Don’t panic (like I did my first time) if you see a little of the dough dip between the grates. This may happen if the dough is rolled extra thin. Use your tongs or spatula and give it a slight turn and it will right itself. The steps below are the same regardless of the toppings. When I make pizza at home, I usually buy a premade dough from a local market, but if you’d like to make your own dough, that’s fine, too. 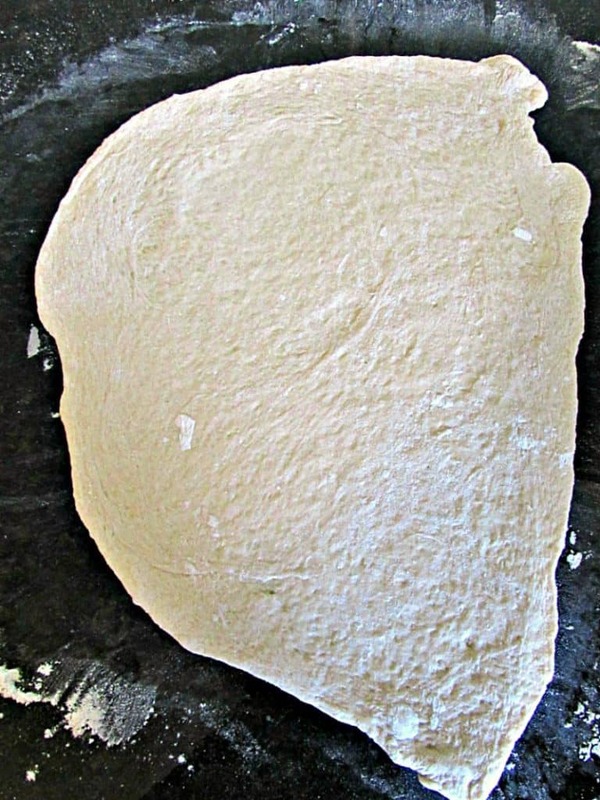 Roll the dough to an even thickness (I like mine on the thinner side), then transfer it to a pizza stone or baking sheet to carry it to the grill. A little cornmeal on the stone or baking sheet keeps it from sticking. Preheat the grill to high heat (about 400 degrees) and using a folded paper towel carefully rub the grates with oil. While the grill is preheating, gather all your toppings. I can’t stress this enough. Collect your toppings on a tray to carry outside because the cooking process is so fast, you don’t have time to run back into the house and risk burning the pizza. The ingredients below are for the pizza shown in the first photo. Swap in or out according to your taste. I combined all the sliced vegetables into one bowl so I had less dishes to wash afterward but left the cheese and herbs separate. After rolling out the dough brush the top with olive oil. If you’d like you can also add a sprinkle of sea salt and fresh cracked pepper or even a little garlic powder. 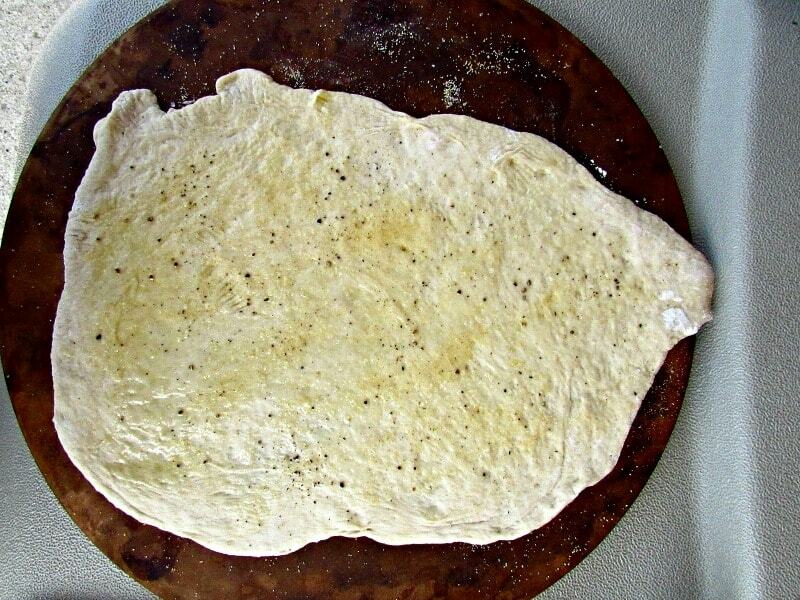 Transfer it to a pizza stone or baking sheet to carry it outside. Once the grill is hot, place the dough on the grill oiled side down and close the lid, grilling 2-4 minutes. The top will bubble as you see in the photo. Grilling times vary depending on your grill, the exact temperature and the thickness of the dough so lift the edges gently with tongs to check for color. Note: our Weber grill is at least 20 years old and doesn’t heat evenly anymore. Ugh. It’s definitely time for a new one. If your grill is the same, you know where ‘hot’ areas are and may have to move the dough to accommodate it. When the crust is gently crisped/charred on one side, carefully flip it, sliding it back onto the baking sheet or pizza stone. 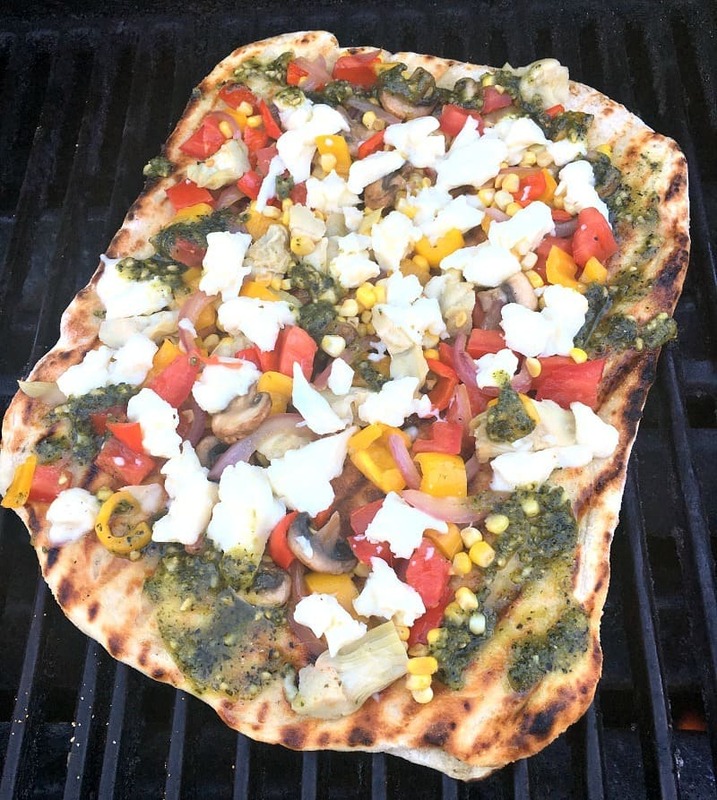 Keeping the lid closed on the grill to retain the heat, quickly add a light brush of olive oil and if you’d like, pesto or pizza sauce and the toppings. You’ll see a variety of pizzas in these photos ~ some with pesto (store-bought or homemade) or classic tomato-based pizza sauce and another with nothing more than olive oil ~ they were all so good! See below ⇓ for other topping ideas. Once the toppings are on the pizza, return it to the grill, reduce the heat slightly and grill 4-6 minutes or until the bottom of the crust is crispy brown, the cheese is softened and the other toppings are warm. Transfer the grilled pizza to the stone or baking sheet and (optional) add fresh herbs and if you’d like a little fine sea salt. Slice and serve hot and if you have a nice sangria on hand, now would be a great time to break it out. Learning How to Grill Pizza is really easy. I hope the tips help yours come out like you want, but if it doesn’t, try again. It’s worth the effort for a really delicious warm-weather meal for family or even summer entertaining. Now that you know How to Grill Pizza, here are a few suggestions as toppings but the possibilities are endless. 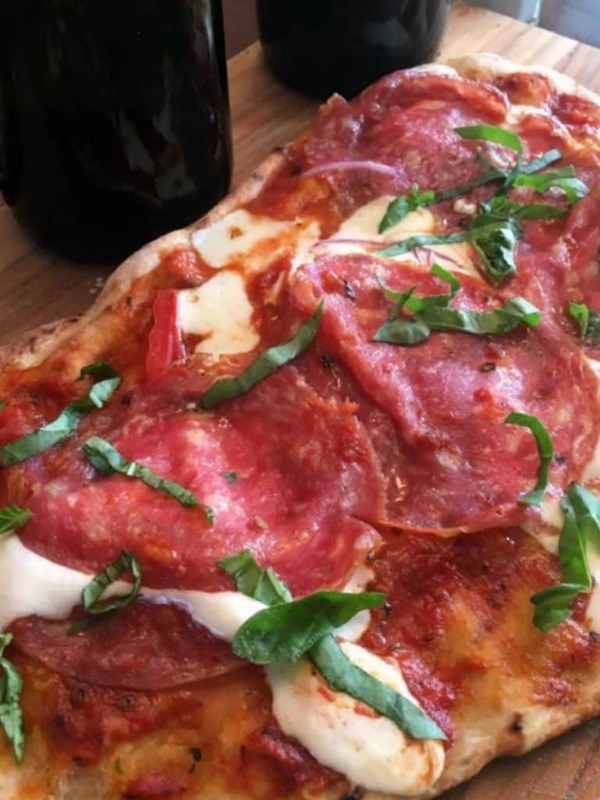 If you’re looking for more inspiration, check out the menus of your favorite pizza places near you. Your your local farmer’s market is a great source for seasonal veggies. Grilled pizza is as close in taste as you’ll get to that great wood-fired flavor in restaurants. Learn how to How to Grill Pizza. You won’t regret it. It really is a gift from summer. Step by step instructions for how to grill pizza with the toppings of your choice. Roll out the dough then brush the top with olive oil. If you’d like you can also add a sprinkle of sea salt and fresh cracked pepper or even a little garlic powder. 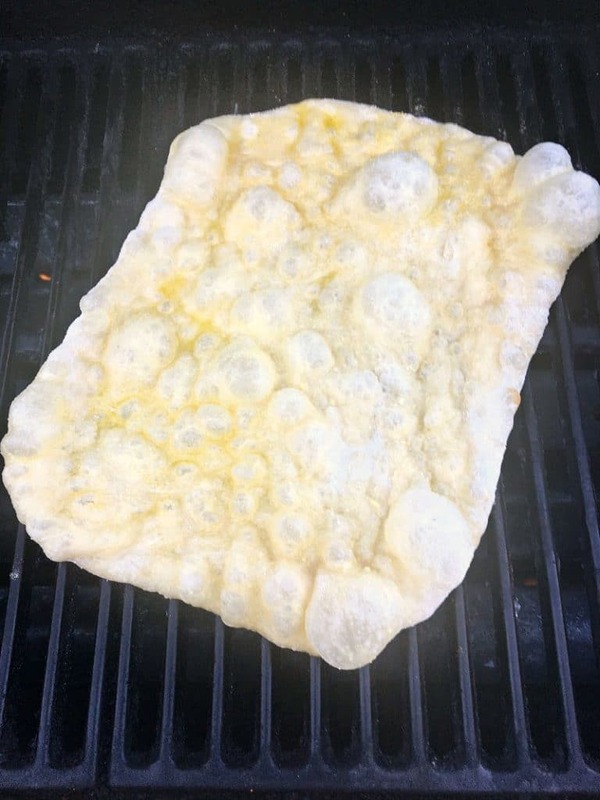 Transfer it to a pizza stone or baking sheet to carry it outside. Once the grill is hot, place the dough on the grill oiled side down and close the lid. Grill 2-3 minutes. You’ll see the top bubble. When the crust is gently crisped/charred on one side, carefully flip it, sliding it back onto the baking sheet or pizza stone. Keeping the lid closed on the grill to retain the heat, quickly add a light brush of olive oil and the toppings. Once the toppings are on the pizza, return it to the grill, reduce the heat slightly and grill 4-6 minutes or until the bottom of the crust is a crispy brown, the cheese is softened and the other toppings are warm. Transfer the grilled pizza to the stone or baking sheet and (optional) add fresh herbs and if you’d like a little fine sea salt. Slice and serve hot. 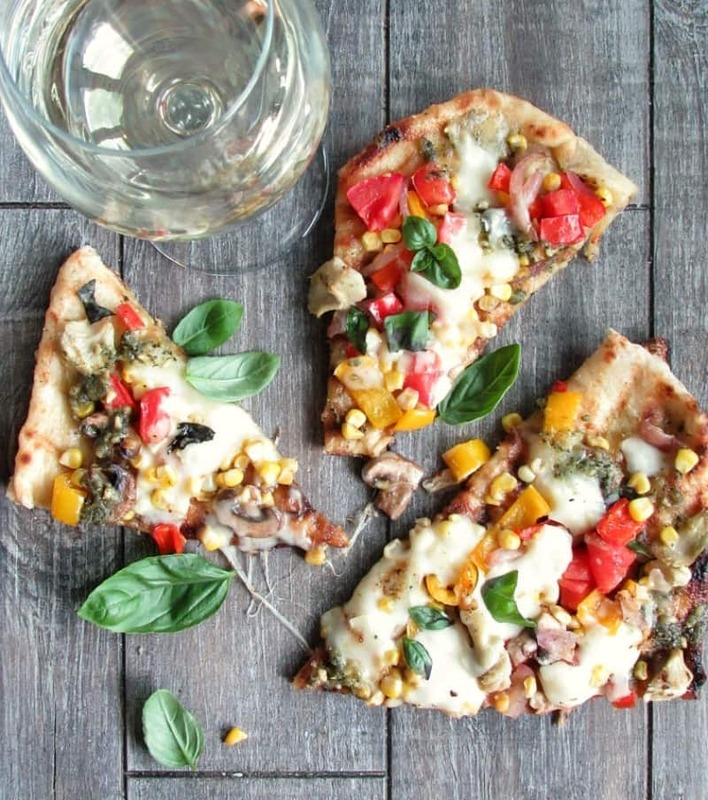 Jiminy cricket honeychile…….this pizza looks so simple and easy with all the tips you included! I have never grilled pizza, but that is changing very soon. You have made it less intimidating…thank you. Pinned. Have a great week my friend. Chat again soon. Oh Mary ~ your kind words always make my day! Thank you so much — believe me, it IS simple ~ and so delicious. Enjoy my friend and have a good weekend.